One of the most visible signs of aging is often the double chin that appears as the lower part of you face begins to accumulate submental fat. While there are surgical procedures that correct this cosmetic concern, at Dr Berens’ Plantation office, we offer Kybella ® – a non-surgical option that creates natural results without the risk or recovery time of surgery. What are Kybella ® Injections? Kybella ® (deoxycholic acid) injection, also known as ATX-101, is the first and only FDA-approved nonsurgical treatment that contours and improves the appearance and profile of moderate to severe fat below the chin. Kybella ® is specifically designed for double chin removal. The fat cells are burst and the overlying skin is left behind. Patients with elastic skin experience skin contraction after the loss of fat cells. The plight of the skin is the same after liposuction. Elastic skin contracts within a few months post treatment. 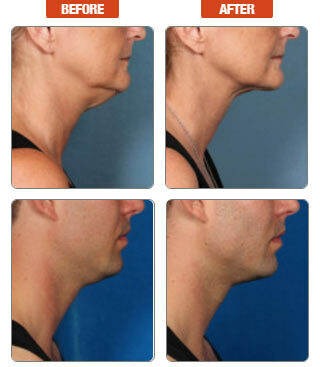 In the case of skin that is less elastic, a neck lift surgery rectifies the lose skin. Am I a Good Candidate for Kybella ® ? Kybella ® is safe for both men and women, and better results are seen in individuals who have taut skin in the neck area. During your consultation, Dr. Berens will assess factors such as your health, medical history and cosmetic goals to help you determine if Kybella ® are right for reducing your submental fat. If you are interested in learning more about the Kybella ® Treatment, please contact my office at (954) 916-1100.